Whether you’re looking to get started on a home workout routine or you want the absolute best workout bench for home, you’ve come to the right place. Figuring out what best bench for home gyms is can be overwhelming, but don’t worry! We researched the top brands and best sellers to find you the best weight bench set for home. But before we get started, let’s take a closer look at some of the features you need to know about before shopping. Angle: This is the angle of the backrest. There’s quite a range here! Some of these benches remain flat while others have as many as 7 different options! Of course, there are a lot of options in between, too. Adjustable: This goes hand in hand with angle because, in order to get to different angles, the bench has to be adjustable. And get this: some of these benches even have different height adjustments, too! Dimensions: If you only have a little bit of space in your home, pay close attention to the dimensions. While some of these benches can fold up for storage, you need to have enough room to actually use your bench, too. Weight Capacity: Pay close attention to this one if you’re planning to lift heavy weights. This is the total weight the bench can handle, which includes you and any barbells or dumbbells you’ll be using for your workouts. Dumbbell Holder: This isn’t available on many of these benches, but it’s a nice feature to have. You won’t need a separate rack for your dumbbells and they’ll always be close by when you’re ready to go. Warranty: The warranties on these benches vary greatly. The best is 15 years for the frame. Some of the better ones give you 10 years. Keep in mind, the frame and the padded bench are usually covered by different warranties. Now that you know a little more about these important features, let’s jump into out weight bench review. Here’s how it works: we put out top and budget picks right at the top of the list. This way, if you’re short on time, you can get a good idea of what’s out there. 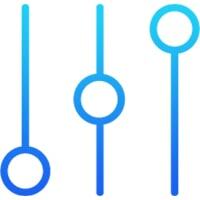 If you have the time, stick around and take a good look at the rest of these awesome products. Alright! Let’s get to it! Our top pick for best weight bench for home gyms comes from Bowflex, a familiar name when it comes to home workout equipment. One reason is that they really understand how to make a workbench versatile. What do we mean by that? With this SelectTech 3.1, you can make adjustments to do more than 30 different exercises. It’s great to use with dumbbells or barbells and helps you maintain good posture while weightlifting so you can lessen any chance of injury. You can position this in 4 different angles. Sit 90 degrees upright or decline -30 degrees using the leg holds to maximize your workouts. This is a great machine that doesn’t take up a lot of space. One last thing: it comes with a pretty awesome warranty. The Marcy Flat Utility Weight Bench is our pick for best weight bench for the money. This bench is really accommodating for a variety of different exercises and it’s the perfect size for your home. The space saving design actually has a pretty small footprint. It’s made of heavy-duty steel and has a high-density foam pad that offers both support and comfort during your workouts. And get this: the frame is powder-coated to resist wear and tear which makes this one a pretty good investment for your home and your health. Using this bench, you can get a full body workout to work on strength-building, toning, and any other fitness goal you have set for yourself. Add some free-weights for an even more intense workout. 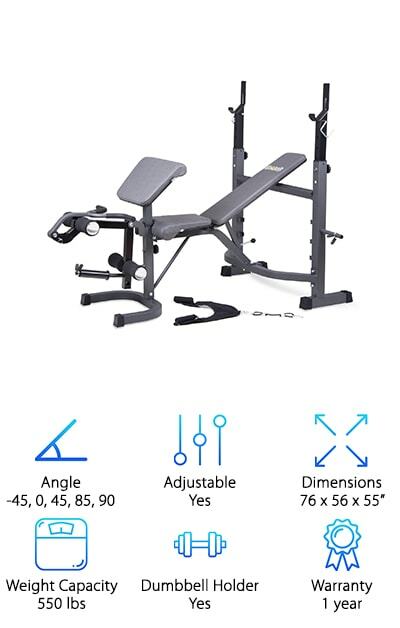 This Universal 5 Position Weight Bench is the best adjustable bench we found in our research. Why? Because it has 5 different positions, including a decline. This bench lets you do dozens of different exercises that work everything from your core to your upper body. The contoured shape and large foam rollers help keep you comfortable while helping you maintain safe body positioning to reduce the risk of injury. One thing that we really loved about this bench is the stabilizer levelers. They make it so you can use it on almost any type of flooring without worrying about any instability. Plus, it’s lightweight and easy to move around. This bench is exceptionally durable and even comes with a 2-year warranty on the frame. The Body-Solid Powerline is definitely in the running for best home workout bench, especially for dumbbell workouts. 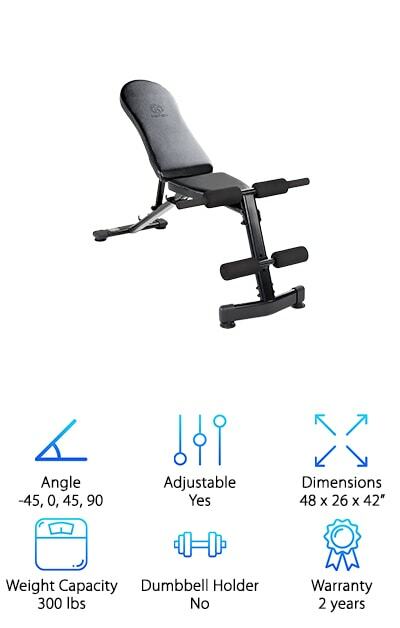 And get this: the 7 different positions make it the most adjustable weight bench we researched. You even get an 18 degree decline! With this bench, you can do crunches, shoulder presses, chest presses and more. It’s really convenient, too, because it comes fully assembled and ready to go right out of the box. Thanks to the bottom transport wheels, you can easily move it wherever you need to. It also folds up so if you need to put it away to make room for anything else in your home, it won’t be a problem. It’s also built really well and even comes with a 10 year warranty. 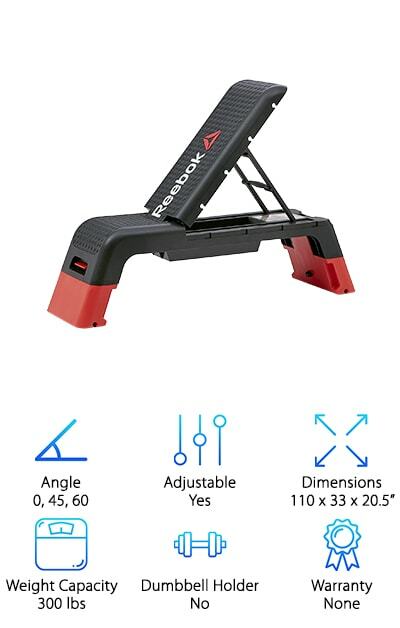 If you’re looking for another option for an awesome folding weight bench, the Reebok Professional Deck is pretty special. It’s made of very strong, durable plastic and only weighs about 20 pounds. This is as simple, portable, but really effective bench. Check this out, you get 3 different angles to choose from: flat, 45, and 60 degrees. Plus, there are 2 different height options to add even more variety. We really loved that you can use this for strength training if you add a set of weights and you can use it as a step for intense cardio workouts, too. It’s really easy to adjust, too, just click and lock in place. The rubber grips on the feet help keep it nice and sturdy while you’re getting your exercise on. Another great choice for best home weight bench is this Incline Bench from Goplus. Not only does it have 3 different angles, it also has 3 different height adjustments, too. It’s a safe bet that no matter how tall you are or what exercise you want to do, you’ll be able to comfortably work it out on this bench. Whether you’re working on your chest, arms, legs, or thighs, the premium padding will help keep you supported and comfortable. Not to mention the design is thicker and wider for even more reliable support. That’s not all. The sturdy frame is made out of heavy-duty steel which means it can hold up to 440 pounds. It also folds up easily for storage or just to move it from one place to another. 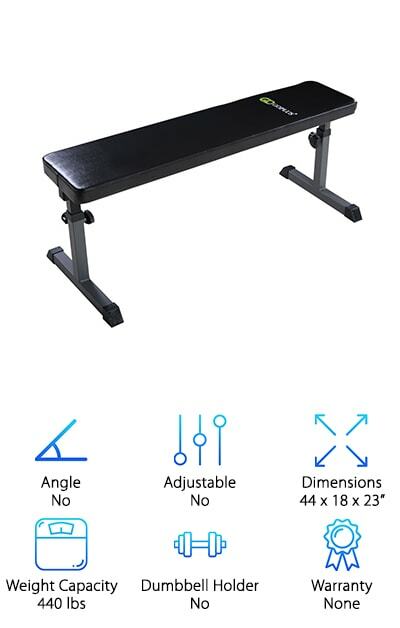 We’re calling this CAP bench our best weight lifting bench because it’s extremely versatile and has 4 adjustable positions, including a decline. And get this: there are dumbbell holders that give you easy access to your weights when you’re exercising. It folds down and is a little more compact if you want to store it or just move it off to the side. It’s pretty lightweight at only 30 pounds so moving it shouldn’t be a problem. CAP has been in business since 1982 and started out selling only free weights and benches. 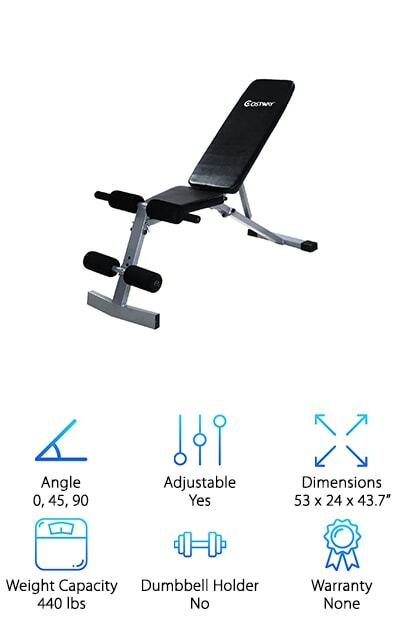 More than 30 years later, even though they’ve expanded, they’re still selling weight benches. That’s why we’re including this as a best weight bench. You can’t argue with a brand that’s been at it for so long! 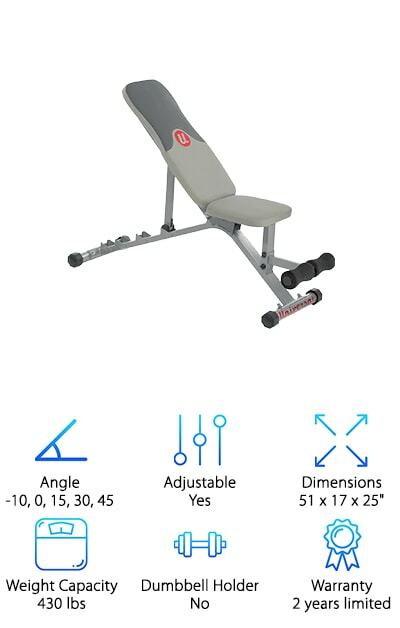 The Marcy Multi-Purpose Folding weight bench can give you a full body workout right in the comfort of your own home. 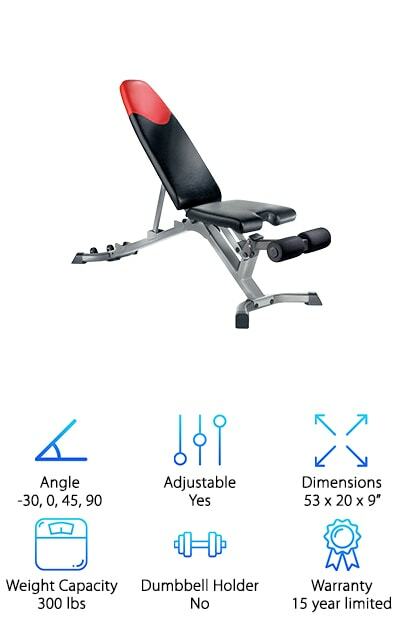 Work on your core, chest, arms, legs, and thighs by taking full advantage of the various angles you can get with this bench. You can adjust it so it’s upright at 90 degrees, 45 degrees, or even flat. There’s more. We’ve seen other benches that decline but this one goes to an impressive -45 degrees. That really gives you a lot more options when it comes to working your core. Plus, it’s ergonomically designed to support your back while you work out so you’ll feel more comfortable and less achy. We really liked the padding and upholstery. It’s soft but supportive and really makes the workout more enjoyable. 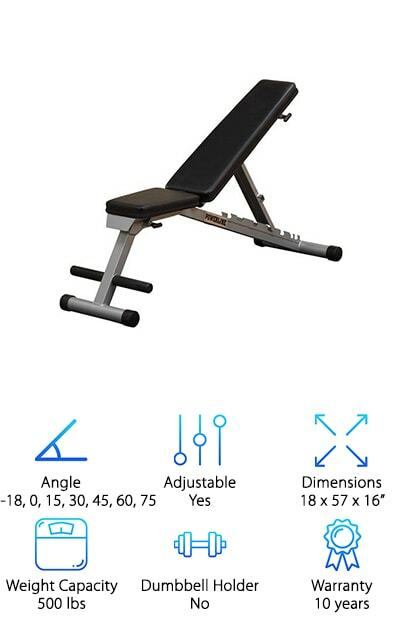 For the best weight bench for home use that’s flat, take a closer look at this one from Goplus. This is a really sturdy bench that’s made out of high quality steel and can hold up to 440 pounds. 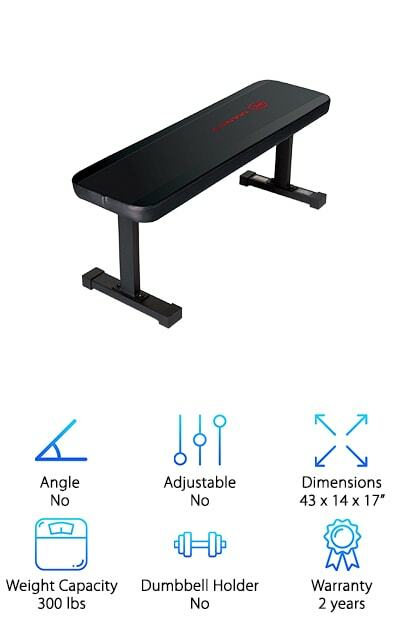 While this flat bench doesn’t have an incline, the one thing that we really liked about it is that it has a height adjustment. You can choose from 3 different heights, ranging from 20 to 23 inches. That’s not all. This bench has a high density foam cushion that supports your body during workouts so you can avoid back pain or other injuries. This bench is really easy to assemble and all of the hardware is included. One more thing. It folds easily so it’s to carry and store if you need to. This is definitely the best Olympic weight bench we found in our research. For one thing, it’s compatible with most weight set bars between 6 and 7 feet long. 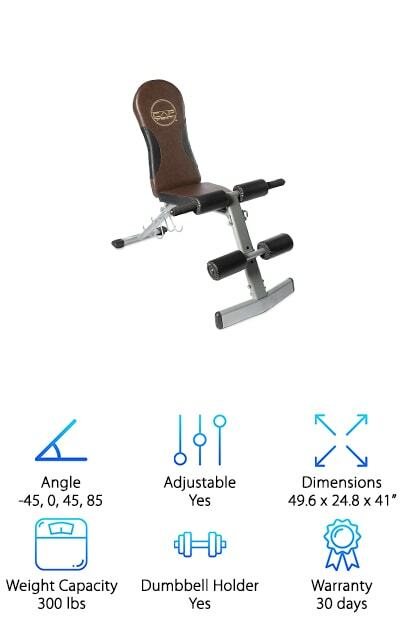 The backrest adjusts to 7 different positions: decline, flat, incline, and military positions let you focus on different muscle groups so you really get a full body workout. That’s not all. It also has a dual-action leg developer so you can give your legs a good workout, too. It comes with a lot of the things you need to get the most out of it, too, like an Olympic plate adapter, preacher curl pad, arm curl bar, and ab crunch attachment with foam grips. You’ll be comfortable while you’re working out, too, because the padding is really supportive.